A Dangerous Collaboration is a mystery novel from Deanna Raybourn. A Dangerous Collaboration was delightful. I may lose my credibility when I say this, but A Dangerous Collaboration was a lot like reading a Scooby Doo novel. It was definitely an adult version of Scooby Doo, but Scooby Doo nonetheless. Veronica and Stoker were staying in a castle on a haunted island, and everything was gothic down to the candlelight and secret passageways. 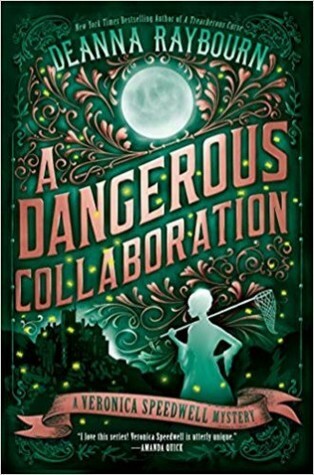 A Dangerous Collaboration is the fourth book in the Veronica Speedwell series. I have not read the previous three, but this one seemed to stand alone just fine. I would have liked to have a deeper understanding of the relationships between the characters, but I was able to dive into the story well enough. Veronica Speedwell is an interesting character. She's a lepidopterist (she specializes in butterflies), and I enjoyed all of the facts about butterflies. It never felt out of place, and I enjoyed the tidbits of nature. A Dangerous Collaboration was plants and butterflies by day, whodunit mystery and family drama by night. I enjoyed this installment of the series. I would happily read more of them. I've read lots of good reviews for this book and series and I'm not sure why its escaped my notice until now, it sounds like fun, especially if it reminded you of Scooby Doo! I love this cover so much! I need to hurry up and dive into this series!